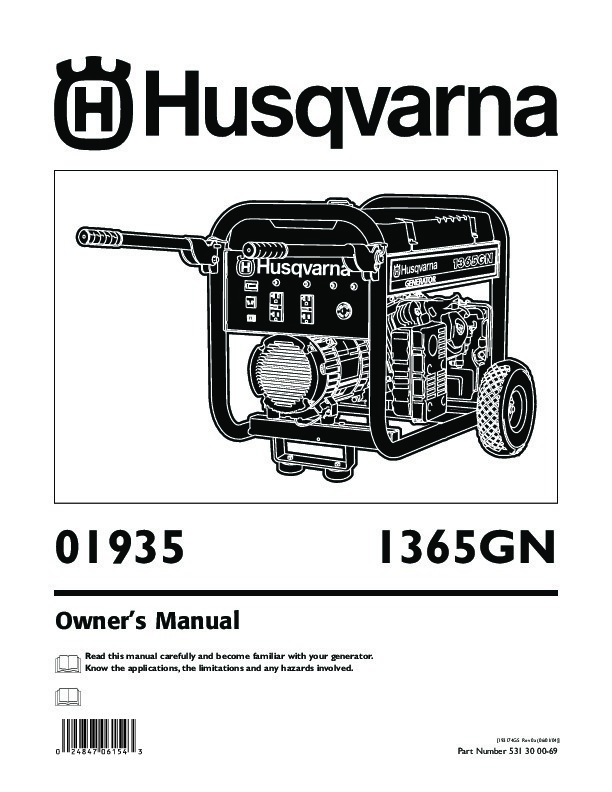 01935 Owner’s Manual 1365GN Read this manual carefully and become familiar with your generator. Know the applications, the limitations and any hazards involved. 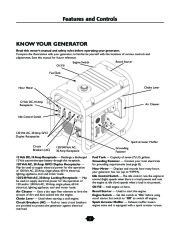 [193174GS Rev 0a (06/01/04)] Part Number 531 30 00-69 Safety Rules TABLE OF CONTENTS Safety Rules 2-4 Know Your Generator . 5 Assembly 6-7 Operation 8-13 Maintenance 14 Storage 15 Notes . 16 Troubleshooting . 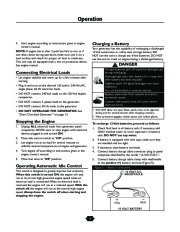 17 Schematic/ Wiring Diagram 18-19 Replacement Parts . 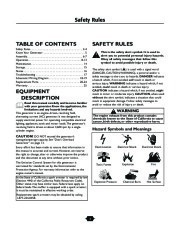 20-24 Warranty 25 SAFETY RULES This is the safety alert symbol. It is used to alert you to potential personal injury hazards. Obey all safety messages that follow this symbol to avoid possible injury or death. The safety alert symbol ( ) is used with a signal word (DANGER, CAUTION,WARNING), a pictorial and/or a safety message to alert you to hazards. 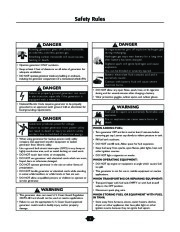 DANGER indicates a hazard which, if not avoided, will result in death or serious injury. 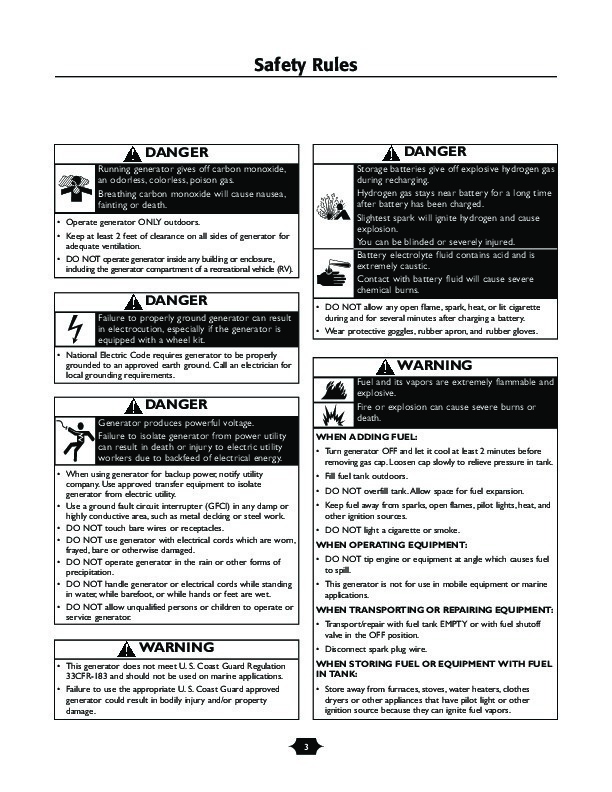 WARNING indicates a hazard which, if not avoided, could result in death or serious injury. 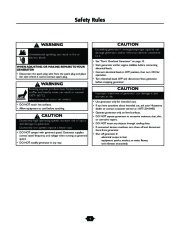 CAUTION indicates a hazard which, if not avoided, might result in minor or moderate injury. 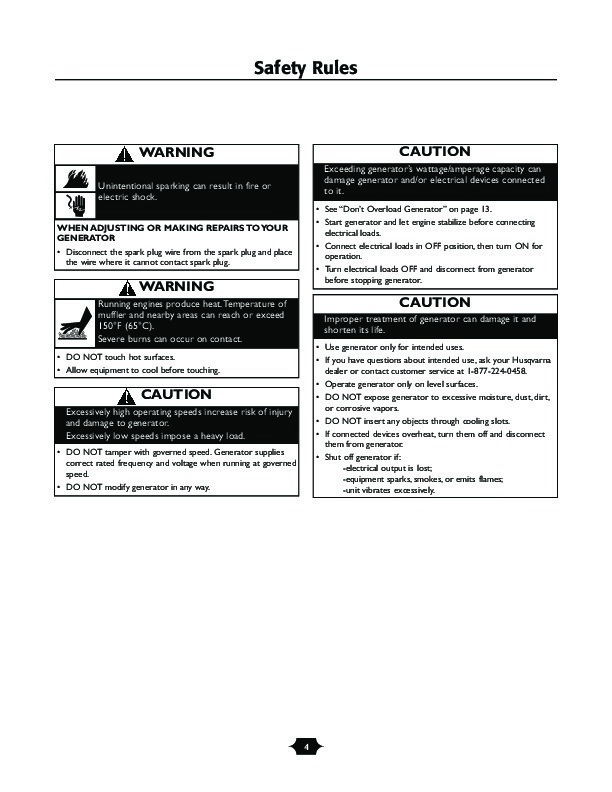 CAUTION, when used without the alert symbol, indicates a situation that could result in equipment damage. Follow safety messages to avoid or reduce the risk of injury or death. 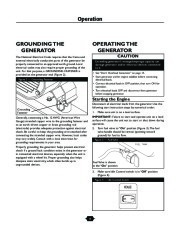 EQUIPMENT DESCRIPTION Read this manual carefully and become familiar with your generator. Know the applications, the limitations and any hazards involved. 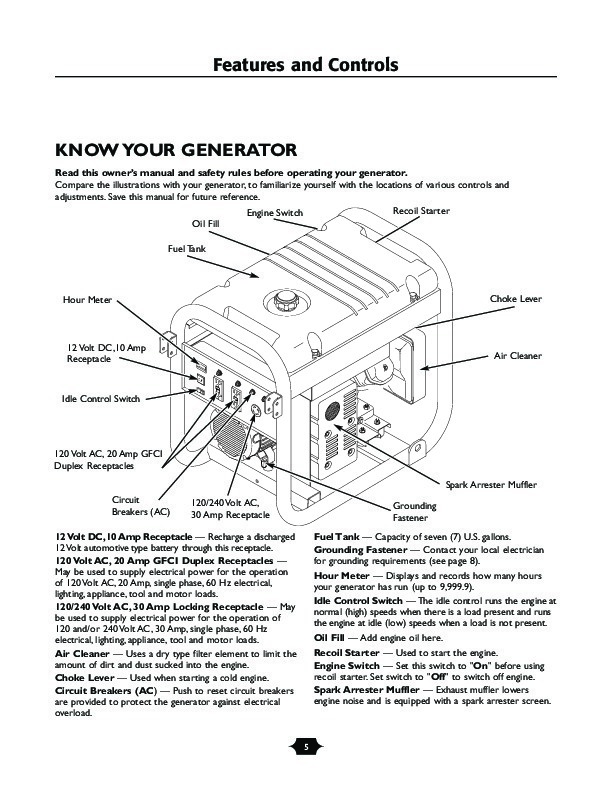 This generator is an engine­driven, revolving field, alternating current (AC) generator. It was designed to supply electrical power for operating compatible electrical lighting, appliances, tools and motor loads.The generator’s revolving field is driven at about 3,600 rpm by a singlecylinder engine. WARNING The engine exhaust from this product contains chemicals known to the State of California to cause cancer, birth defects, or other reproductive harm. Hazard Symbols and Meanings CAUTION! DO NOT exceed the generator’s wattage/amperage capacity. 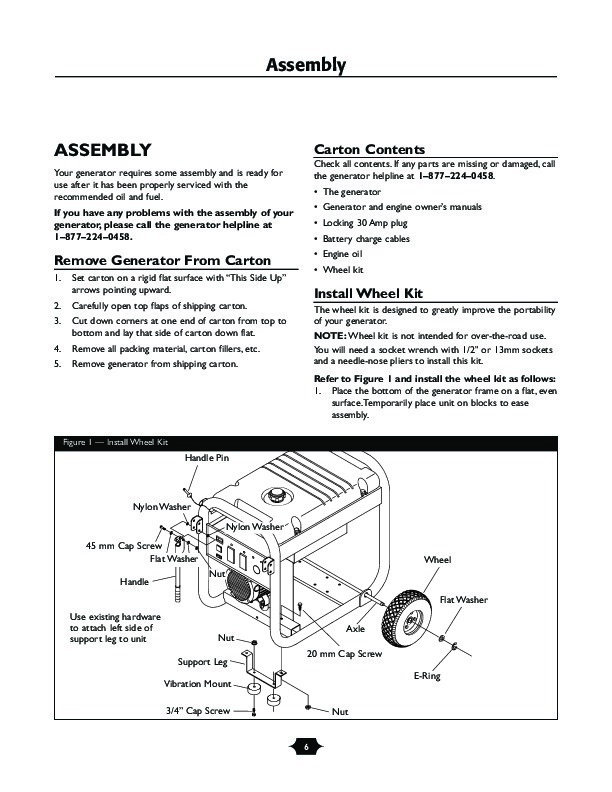 See “Don’t Overload Generator ” on page 13. Every effort has been made to ensure that information in this manual is accurate and current. However, we reserve the right to change, alter or otherwise improve the product and this document at any time without prior notice. The Emission Control System for this generator is warranted for standards set by the Environmental Protection Agency. 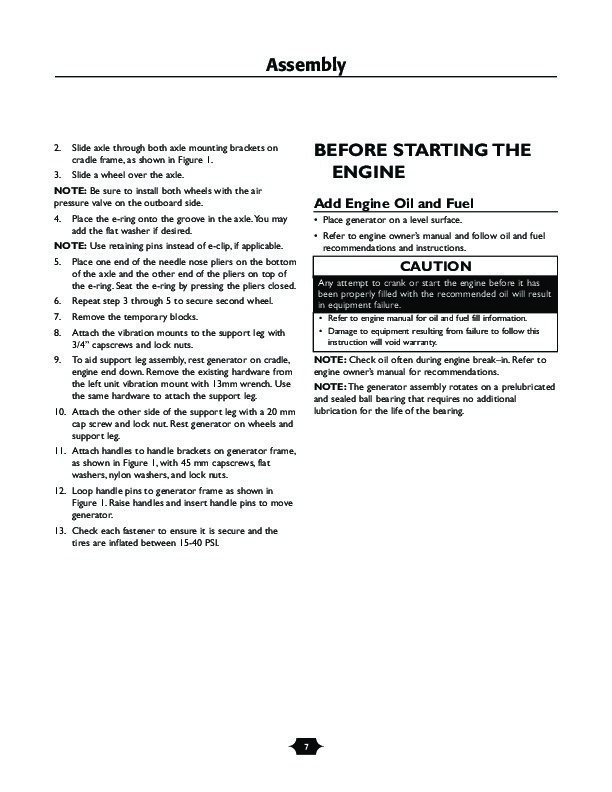 For warranty information refer to the engine owner’s manual. In the State of California a spark arrester is required by law (Section 4442 of the California Public Resources Code). Other states may have similar laws. Federal laws apply on federal lands.The muffler is equipped with a spark arrester; it must be maintained in effective working order. Replacement spark arresters may be obtained by calling 1-877-224-0458. 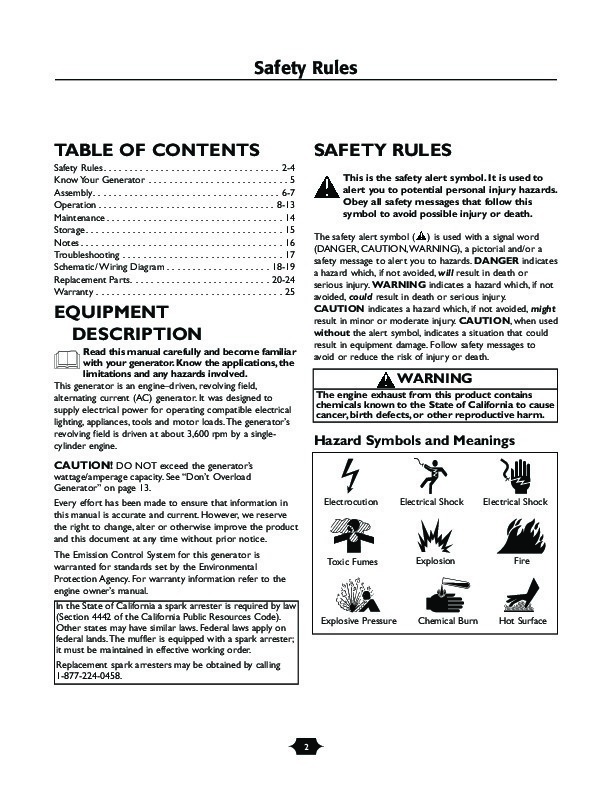 Electrocution Electrical Shock Electrical Shock Toxic Fumes Explosion Fire Explosive Pressure Chemical Burn Hot Surface 2 Safety Rules DANGER Running generator gives off carbon monoxide, an odorless, colorless, poison gas. Breathing carbon monoxide will cause nausea, fainting or death. 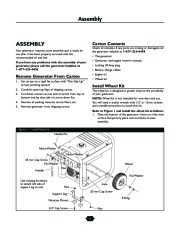 · Operate generator ONLY outdoors. 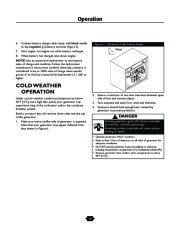 · Keep at least 2 feet of clearance on all sides of generator for adequate ventilation. 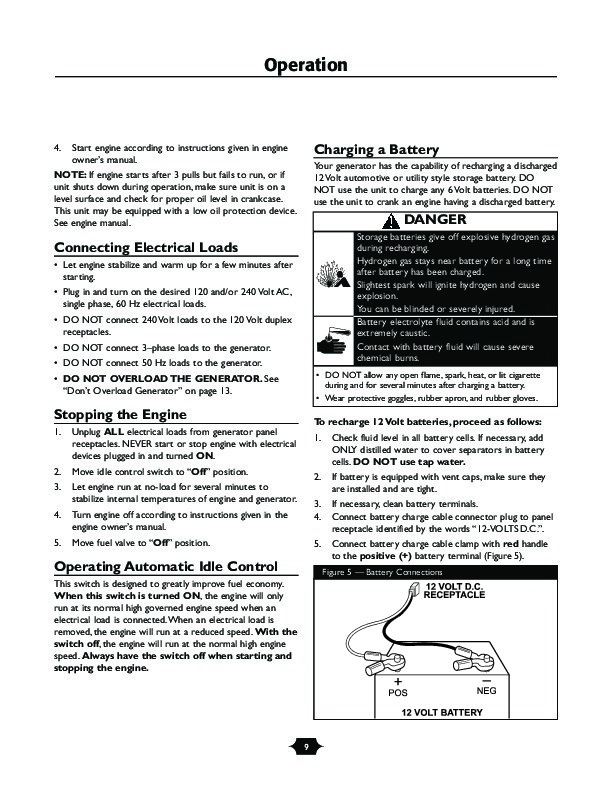 · DO NOT operate generator inside any building or enclosure, including the generator compartment of a recreational vehicle (RV). DANGER Storage batteries give off explosive hydrogen gas during recharging. Hydrogen gas stays near battery for a long time after battery has been charged. Slightest spark will ignite hydrogen and cause explosion. You can be blinded or severely injured. Battery electrolyte fluid contains acid and is extremely caustic. Contact with battery fluid will cause severe chemical burns. · DO NOT allow any open flame, spark, heat, or lit cigarette during and for several minutes after charging a battery. · Wear protective goggles, rubber apron, and rubber gloves. DANGER Failure to properly ground generator can result in electrocution, especially if the generator is equipped with a wheel kit. 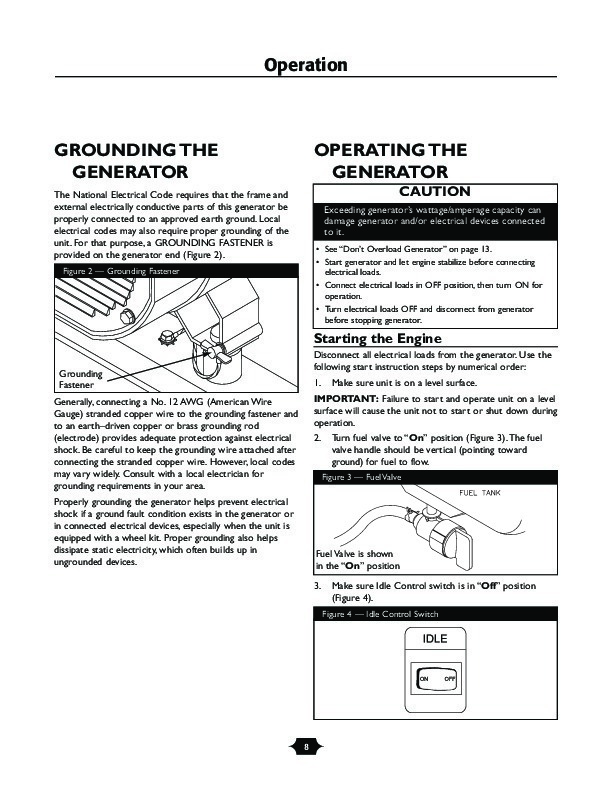 · National Electric Code requires generator to be properly grounded to an approved earth ground. Call an electrician for local grounding requirements. WARNING Fuel and its vapors are extremely flammable and explosive. Fire or explosion can cause severe burns or death. WHEN ADDING FUEL: · Turn generator OFF and let it cool at least 2 minutes before removing gas cap. Loosen cap slowly to relieve pressure in tank. · Fill fuel tank outdoors. · DO NOT overfill tank. Allow space for fuel expansion. · Keep fuel away from sparks, open flames, pilot lights, heat, and other ignition sources. · DO NOT light a cigarette or smoke. 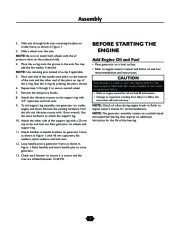 WHEN OPERATING EQUIPMENT: · DO NOT tip engine or equipment at angle which causes fuel to spill. 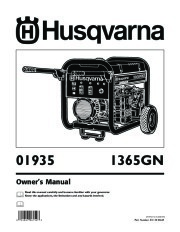 · This generator is not for use in mobile equipment or marine applications. WHEN TRANSPORTING OR REPAIRING EQUIPMENT: · Transport/repair with fuel tank EMPTY or with fuel shutoff valve in the OFF position. · Disconnect spark plug wire. WHEN STORING FUEL OR EQUIPMENT WITH FUEL IN TANK: · Store away from furnaces, stoves, water heaters, clothes dryers or other appliances that have pilot light or other ignition source because they can ignite fuel vapors. DANGER Generator produces powerful voltage. Failure to isolate generator from power utility can result in death or injury to electric utility workers due to backfeed of electrical energy. 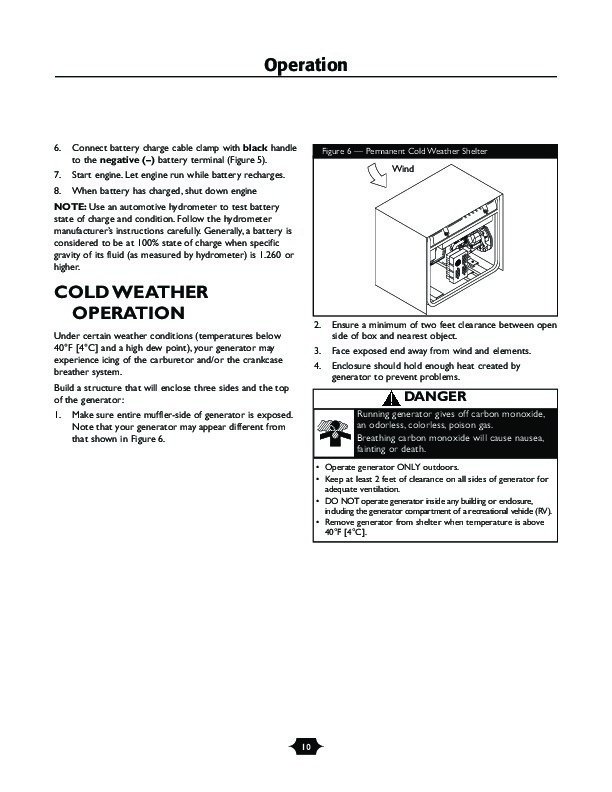 · When using generator for backup power, notify utility company. Use approved transfer equipment to isolate generator from electric utility.